Erik Barray has designed a nature trail on Montée du Gourguillon sprinkled with five plant-themed stops. Once past Place de la Trinité, nature takes back what is rightfully hers, as trees and plants climb the high walls, transforming the venue into a Lewis Carroll-type fantasy world. Nature muscles her way into every crook and cranny in a tangle of creepers, while ivy runs along the stone walls like curtains of gleaming greenery. Delicate, illuminated flowers punctuate these natural arrangements that exude a surreal atmosphere. Turning and twisting, the plants play with the light as it reflects off the stones. 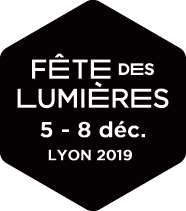 At the top of the hill, on Rue des Farges, this immersive, poetic stroll is broken up by an overhanging tree decked with nests of magical lights.